Let them lie. 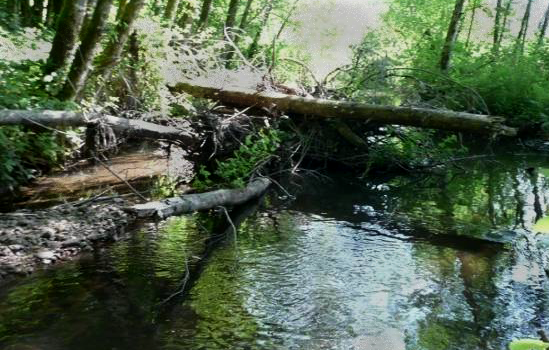 Log jams make good fish habitat. In the past, we thought it was a good idea to clean up the log jams that “choked up” steam chan­nels. As a mat­ter of fact, Ore­gon used to have employ­ees whose pri­mary role was dyna­mit­ing log jams in rivers. Today, things have changed. We now under­stand that pulling logs and other wood out of streams really lim­its the cre­ation of pools and hid­ing habi­tat for fish. Logs and tan­gles of woody debris in a stream play impor­tant roles in cre­at­ing sev­eral dif­fer­ent habi­tats that are impor­tant to steel­head, migra­tory salmon, and other fish. Large wood pro­vides over­head shade that helps keep water tem­per­a­ture down and at the same time pro­vides the cover young fish need to escape from predators. By par­tially block­ing stream flow large logs can cre­ate pools upstream or encour­age the down­stream devel­op­ment of gravel bars, used by adult fish for spawning. The logs them­selves are habi­tat for some of the aquatic insects that are an impor­tant food source. So, log jams are vital for main­tain­ing fish habi­tat. Now that you know it, do a fish a favor and let those (sleep­ing) logs lie.